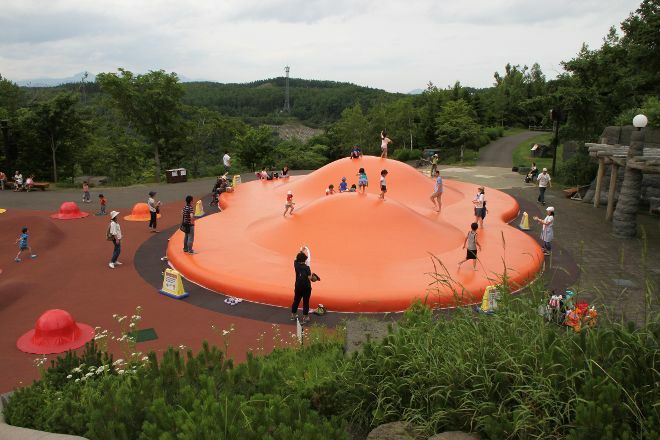 Separated into six thematic zones, Kokuei Takino Suzuran Hillside National Park offers various outdoor and educational activities. The only national government park of Hokkaido, this huge 395 ha (977 ac) park stands at 160-320 m (524-1,049 ft) altitude. Mountain streams, forests, flower gardens, and playgrounds for children make the area perfect for a family day outing. From gorgeous tulip gardens in the spring and fishing in the summer, to Takino Snow World in the winter period, everyone can find something to do or enjoy all year round. This popular spot for locals, with a wide variety of outdoor activities and ski rental, sits 35 minutes from Makomanai station. Choose to start, finish, or center your holiday on a trip to Kokuei Takino Suzuran Hillside National Park by using our Sapporo online driving holiday planner . Fun tube sliding in swimming and athletics, slide in the playground and lots of egg fluffy is in the summer, but winter also play in the dome and the 200 m. Especially recommended is held at the beginning of February Snow Festival. Where small children can play games or bucket lantern making and build a snowman, winter fireworks are spectacular. It is a powerful fireworks in the skies and forget the cold, innocent and look up at the time. Be satisfied that no doubt. Definitely go again next year! Our family of three came here at the end of January 2019 to play, has entered the peak season, specially selected weekdays to play, to avoid the weekend. But in fact, even on weekdays, there are many people who come here to play, mostly tourists. The facilities in the park are perfect and ideal for parent-child tours. When we arrived that day, it snowed heavily, somewhat affecting the experience, and before we came, we had to look at the weather forecast, because most of it was outdoor activities. The experience in the scenic area is good, the park's service staff is also more enthusiastic. The only thing that needs to spit is the traffic to and from the park, and it takes about 35-40 minutes to get to the park by bus after sitting at the south end of the Sapporo subway. But the bus to and from the subway station and the park has only one line, in the high season when the capacity is obviously insufficient, the bus is very crowded, if the younger children are very inconvenient. My son, five years old, got on the bus and went to the park, and by the end he was very upset. The last flight to the return bus is 4:10 P.M., and if you can't take the bus, you won't even have a taxi. So the high season words are best to self-driving, here is also more friendly to self-driving, parking lot is relatively large. Using the body or take a walk and enjoy the fishing in the cycling, fun playground play there is, one day is not enough. I visited this place this summer and had a wonderful time roaming the park. This place is so beautiful it makes one feels happy and young. There are beautiful flowers, fun playgrounds and zen waterfalls to explore. I would love to visit this place againduring spring, autumn and winter seasons. Beatiful and fun place. Very suitable for family with kids. The kids area are so big, we can stay there all day long. Kids will definitely love this Free Snow park with a lot of choices games for them to choice from, especially the toboggan...adult will love the breeze and view of the park....will definitely come back in the near future. Great place for nature walks. Lovely gardens and flowers like lavenders. Definitely going back if possible. Every day, we help thousands of travelers plan great vacations. Here are some tips on how to use your Listing Page to attract more travelers to your business - Kokuei Takino Suzuran Hillside National Park. Promote your permanent link - https://www.inspirock.com/japan/minami/kokuei-takino-suzuran-hillside-national-park-a652598803 - on your website, your blog, and social media. When a traveler builds a plan from this page, the itinerary automatically includes Kokuei Takino Suzuran Hillside National Park. This is a great way for travelers looking for a great vacation in your city or country to also experience Kokuei Takino Suzuran Hillside National Park. Promoting your link also lets your audience know that you are featured on a rapidly growing travel site. In addition, the more this page is used, the more we will promote Kokuei Takino Suzuran Hillside National Park to other Inspirock users. For best results, use the customized Trip Planning Widget for Kokuei Takino Suzuran Hillside National Park on your website. It has all the advantages mentioned above, plus users to your site can conveniently access it directly on your site. Visitors to your site will appreciate you offering them help with planning their vacation. Setting this up takes just a few minutes - Click here for instructions.